...and Lucy for a ride. Anybody who comes bearing "Oven-baked Donkey Delights" is a friend of Lucy's. Then it was time for happy hour. Hard to say who was happier here. 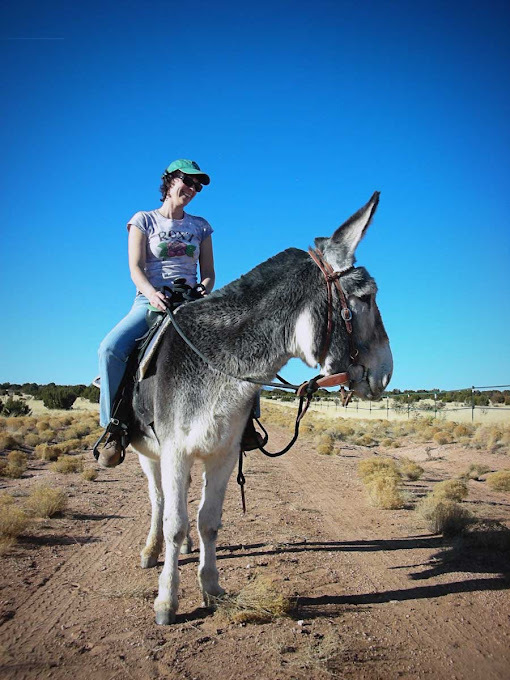 She looks great on Lucy, but we want to see YOU riding her! Sooooo glad to see George happy :) Have a great weekend. Now you see her, now you don't, and all of a sudden farmgirl is in N.M. wearing a cool green cap, riding a donkey, kissing a donkey, a donkey kissing her while having a glass of wine! What's next, one asks? Ohhhh I am pretty sure George thinks she came to see him, and only him. He looks so happy. Did he invite her to stay in the barn tonight? You were talking about a guest this weekend and when I checked in with Danni's blog this morning she gave hints -- especially going someplace warm and dry -- and I thought she might be visiting the 7MSN. George looks like he is in blissful Heaven. Wishing all of you a wonderful time. Lovely photos! Your place is so beautiful. Nice to see photos of Danni too. 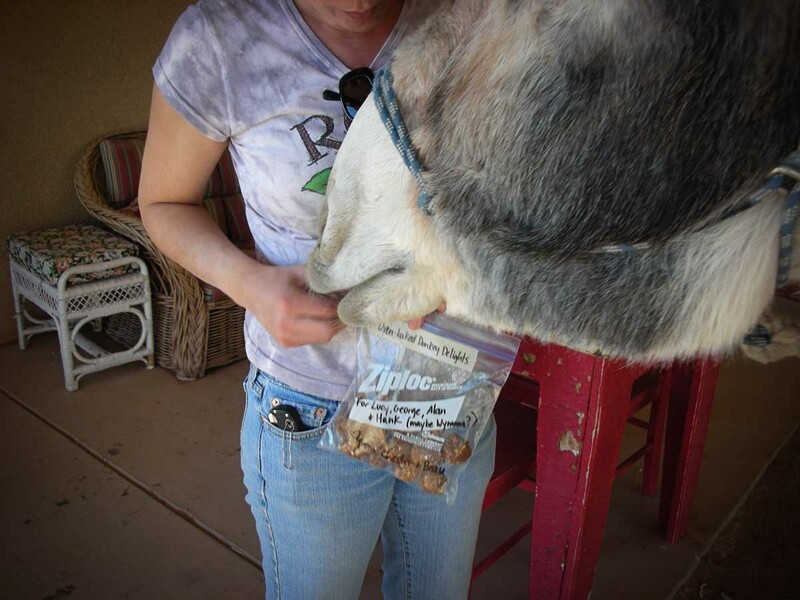 Oven baked donkey treats and all. Have a fun visit! Oven-baked Donkey Delights look good :D Will Lucy share? Really happy hours for you all, the photos show it. And thanks for some happy minutes for me while viewing them. 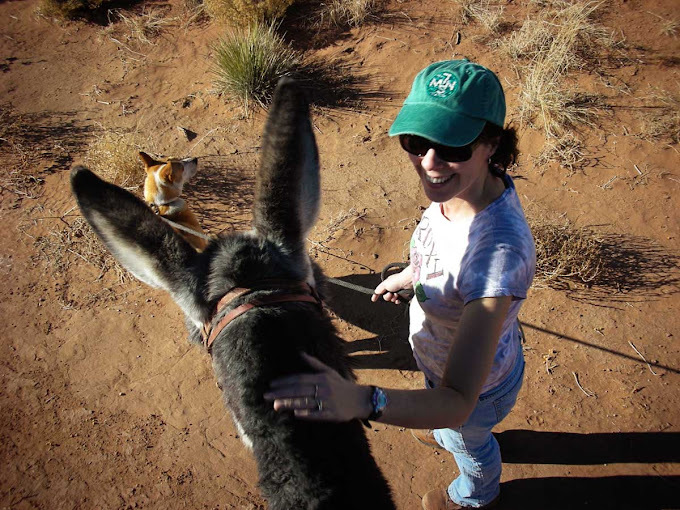 Your pictures of Danni and the critters are wonderful Linda!! I love the one with the Eskimo kiss, they both have the same face!! Ya'll have a great time! Oh, I love that last picture!!! Glad you gals had fun!!! Check out Lucy. She's in love. This is such a sweet posting today. While Smooch, Lucy, and George are all great to see, I'm afraid the first thing I noticed on this post is that it is warm enough there to go in just shirtsleeves. I'm so jealous. Sigh, it's still coat weather here in northeast Kansas. Looks like everyone is having a wonderful time there. Have a great weekend! Er, uh...I think Lucy LOVES attention! 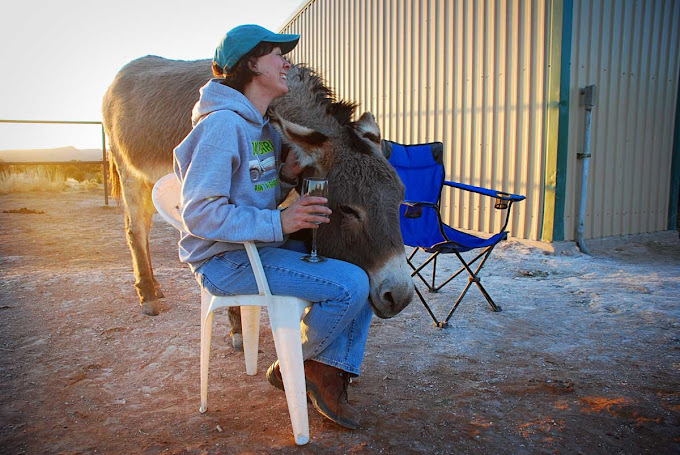 Wine and a donkey, what more could a girl ask for? What beautiful photos! Glad to see everybody having a wonderful time. Danni will need to take some photos of you on Lucy for all of us to see. Have a LOVELY week end. O.K. I got it..went to Critter Farm and saw a couple photos of Linda and Lucy and page two the rest of the story. I'm new to this whole blog THING. Must put Danni's blog on my favorites as well. What you have the matching book ends to George and Alan at your place, Danni? Have FUN :) Lucy is great to ride isn't she!!!! Awww, Lucy just seems like such a sweet, sweet girl! You are truly blessed and I think she is too. Looks like it's going to be a fabulous weekend...for everyone! You girls try to behave yourselves way out there in the middle of nowhere! What great pictures and what a wonderful "new" blog for me to visit. Thanks so much for pictures with Danni in them, for us Critter Farm fans don't get to see much of her since she's always behind the camera rather than in front! Have a blast with the New Mexico friends and enjoy the beautiful weather! I hope the next post are pictures of George sitting in Danni's lap! At least it looks like it is heading that way. :) Have fun!! Lucky Danni! I didn't guess from her posting that she was headed to 7MSN. Please have her take a photo of you riding Lucy. I forgot to mention to you this morning that you make really good coffee. p.s. My pasty-white Oregon skin can't BELIEVE all this incredible sunshine!! At last- an ear cam picture! So nice to see George looking so happy- I swear he's about to purr! You both are awesome and we are so happy that we got to spend the day with you today. OMG! how fun that you two are hanging out. 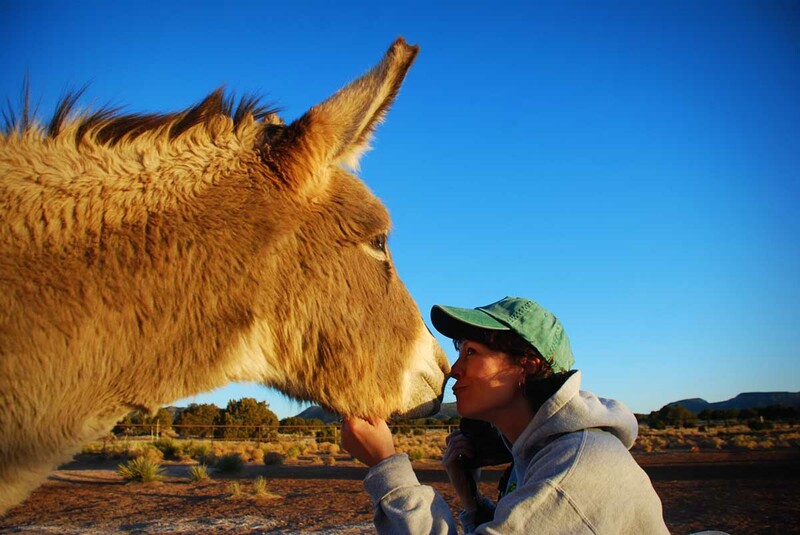 2 of my favorite donkey blog folks at the same place.... I'm hoping we'll get some shots of the third in there, too, and it will be a trifecta!!! It looks like all of you are having a good time! Danni--Enjoy the dry weather in NM! I love your Roxy shirt! The 7MSN crew looks welcoming, too. A little happy hour in the corral at the end of the day. What a great end to the day. Oh so much fun, thanks for sharing you two! My two favorite blogs collide into happy tails. That George is kind of like a big Golden Retriever, keep petting him and he'll be in your lap shortly? Too cute. That looks like one pleased donkey for happy hour. Looks like everybody had a fantastic weekend. 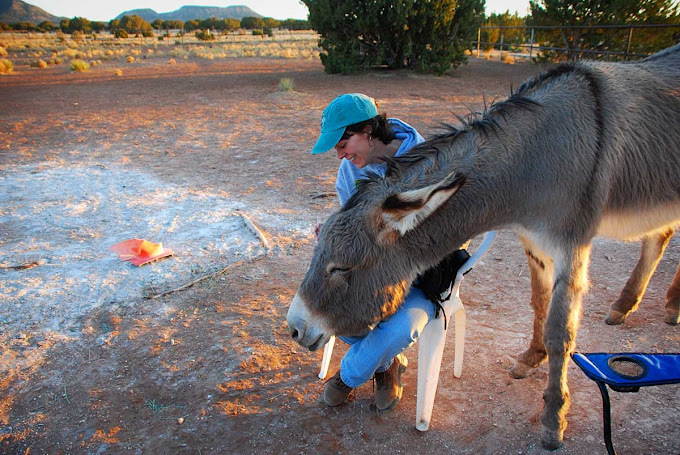 And I found a new donkey blog to follow. What fun! !